Its/It’s — and other general apostrophe problems. Proper use of commas. This a huge topic, but it’s one worth knowing well because so many things can go wrong with commas. Whether it’s an error like “eats, shoots & leaves” or an error like “I’m coming to eat Grandfather,” they drive me batty. This Grammarly page looks like a good overview. Word choice — specifically as it applies to your industry. This is a pretty open ended suggestion, but in some ways it matters the most! For example, you wouldn’t want to work with a First Amendment lawyer who used “slander” and “libel” interchangeably… or a wedding planner who misspelled “stationery.” You should be absolutely sure you understand the meaning and proper usage of any words you use often at work, as well as any terms of art. Pictured: Pedantry FAIL, originally uploaded to Flickr by Tom Beard. Problem is, “effect” can be a verb and “affect” can be a noun. Your guideline is an okay start for people who are really stuck, because the words are more commonly used as you describe, but not completely accurate. Affect = how a person rolls. How will this new law affect citizens? Its effect is yet to be seen. Even better… effect can be used as a verb and affect can be used as a noun! I work in science, where effect (as in cause and effect) is pretty darn important. But I can never remember if I am using effect properly or it is the weird case where I should be using affect and I manage to talk myself in circles. So 95% of the time I just give up and re-write the sentence in a different way so I don’t have to second guess myself and look like an idiot in a customer report. I use “impact” more than I would like, for that very reason. The use of a double space after a sentence. I get that for many people who grew up in an era of typewriters it’s ingrained in how they type, but it’s become unnecessary and obsolete now and I cringe when people write external communications with it, like job descriptions. Worse is when it’s used inconsistently, where some sentences have one space after them, some two, and some of them inexplicably have three! So if you insist on using extra spaces or can’t kick the habit, at least be consistent about it. Also, I hate when people Capitalize the first letter of a Word just to add Emphasis or Importance to it. Oh, and I can’t stand when people say “less” when they mean “fewer.” Drives me crazy, but I try not to correct it . . . all the time . . . This is a geek moment for me, but I SQUEEd with delight watching Game of Thrones. I laughed. No one else got it. It really was. he may be awful and burn his daughter alive, but at least he has his grammar down. I LOVED that moment. So Stannis. 2. I have seen some grocery stores with “X items or fewer” lanes. Awesome! If you asked me correctly, perhaps:). Anon @ 2:50, this could be correct if “were” is used to denote subjunctive mood. This is probably my biggest grammar pet peeve! Glad I’m not the only one! Please help — some of the partners I work for like 2 spaces, and some prefer 1. I can never get it right! I will never be able to give up two spaces after a period. Okay, then just make sure you always put in two spaces. If you only do it sometimes, it looks like a typing error or a sloppy copy-and-paste job. I consider this one a preference not a rule. And it isn’t grammar. How is that for pedantry? Agree that this is a preference and is certainly not grammer. The first law firm I worked at required it, and we were tested on it in school, so…I’m a two-spacer for life. However, if I don’t “own” a document, I try to conform to the current style therein. Trolling y’all with “grammer” up there! As long as the person who insists on using two spaces admits it is merely a preference, I don’t care that they’ve made their preference known. Otherwise I’m stuck thinking this and cursing them in my head. Preach. It doesn’t look right with only one. Ditto. Two spaces after a period. Always. You can pry my two spaces from my cold, dead, hands. Two spaces forever. It’s not acceptable at my law firm to use only one. Double spacing isn’t a grammar error. It’s a style preference and many of us are still required to use it. I’m a double-spacer to the core. But full justification just makes it all look so weird. Left justification, y’all! I went through a phase in high school where everything I wrote was fully justified. To me it just looked neater. But I think I kicked the habit somewhere in college, I forget exactly when. YUCK. I hate when things aren’t fully justified. After a few years where my job fully justified everything, I can’t help but think “sloppy” when things are left-justified. It seems unprofessional to me. But when it’s online, it looks really, really messy and old-fashioned. I hate it but it’s required in my office. Some courts require double spacing after each sentence. My secretary will seriously cut you if you send her a document with only one space between sentences. The Supreme Court requires two spaces after each sentence. Okay, so I don’t work in law. I’ve never worked in law. I know a lot of women here do, I don’t, so I had no idea that this was standard in the legal world. If something is an industry standard, then by all means conform to that, I’m not trying to incite rebellion among young lawyers or anything! But when you’re working in an industry where your writing needs to appeal to the general public, especially relatively young members of the general public, the double space makes you look incredibly stuffy and out of touch. I didn’t mean to imply that two spaces, or the other stylistic choices I cited, are standard in law. To the extent they are, it’s probably because the people who make the decisions learned to type on typewriters (or, more accurately, their secretaries did, and they still dictate or use the hunt-and-peck method of typing). My firm doesn’t even have a standard style. Instead, each partner has stylistic preferences, which many of them treat as “rules.” I’ve learned most of their preferences, or ask their assistants. What drives me crazy is when I circulate something for revision, and the people editing change the styles to suit their preferences, or enter their edits according to their stylistic preferences so that everything is inconsistent throughout the document. Then my assistant has to spend time redoing everything to conform to the senior partner’s preferences, or I get yelled at. If there WERE a standard, either in the firm or the industry, that everyone would conform to, that would make my life so much easier. And if I could choose a standard, it would be one space after a period, left-justified, and regular punctuation in headings. One can dream. No, it doesn’t. Just drop it. It’s very odd that you’re making these declarative statements despite all the comments contradicting you. Last comment was directed at jitterbug. I’m not in law, but I love double space after periods. That’s how I learned to type as a kid, and I’ll stick with it forever. My office recently changed its style guide to just one, but in all other writing, I still use 2. I had heard of this–attorneys having something against the Oxford comma. It boggles my mind, since Oxford commas tend to add clarity to writing. Unless…clear communication is not the goal? @ Jitterbug- Your judgment and “cringing” is misplaced. For all your sanctimony, this isn’t even a rule of grammar. Rather, it’s a preference, and for many court docs, a requirement. So now I’m actually cringing for you, that you saw fit to cast aspersions and yet didn’t even know that. When people pluralize by using an apostrophe – particularly with proper nouns. Christmas cards are the worst offenders! Oh yes! I’d say this is one of the most important! People do it ALL THE TIME and it really lowers your credibility. (“Merry Christmas from the Smith’s” — from the Smith’s what? The Smith’s cat?) I’ve never understood this. Other errors I can kind of see how people make the mistake, and if it were the other way — people left out an apostrophe when it was needed — I might understand but what on earth makes people add in an apostrophe that’s not necessary? I totally agree with you about how annoying this is and how bad it makes the user look, but I am also chuckling about the idea of folks’ Christmas cards “lowering their credibility”… as senders of greeting cards? Ugh. My sister married someone and her new last name ends in S (e.g., Ann Landers). I have seen that omitting the extra sibilant is acceptable. My maiden name ended in S. We were just the V—-S Family. Yeah, The Landers is not wrong. Landerses sounds awful and clunky. This is the worst, BY FAR. I see this error almost every day. Any mixing of words that actually mean different things makes me crazy. So effect and affect, as the poster above said, but also “free reign,” “floundered on the rocks,” “take a different tact,” pour/pore/poor, “it didn’t phase me.” I’m giving up on lay/lie, although it still is like fingernails on a chalkboard. But even these mix-ups are common enough that I’m not sure how harmful they are (I feel like everyone now writes “free reign”). A flounder on the rocks would be in a very tough spot, no? It also sounds like a very odd cocktail. It is. It makes me grind my teeth to see “phase” as well. These are the two that make me most crazy! It is FREE REIN, people. As in letting the horse go as fast as she wants and not reining her in. I am on a two-woman crusade (my mom got me on this crusade in the first place) to get people to use farther and further correctly. The comma one Kat shows is really kind of personal preference. I adore the Oxford comma, but it’s not a requirement. Using adjectives and adverbs incorrectly (see? incorrectly — not incorrect) also drives me nuts. And with AP style, the Oxford comma is not allowed. I was going to post that re Oxford comma and then I re-read it and looked at the link to the book and I think what it’s trying to say is “eats shoots and leaves” (like “a koala eats shoots and leaves”) as opposed to “eats, shoots, and leaves,” so she’s saying the first comma is clearly incorrect, not that it should have an Oxford comma. Yes — the Stalin one is awesome. You can pry my Oxford comma from my cold, dead, and clammy hands. +10000 on the use of adverbs and adjectives! The missing “ly” drives me crazy! I regularly see misuse of rein/reign. It’s not free reign, but free rein. Interestingly, I see it more often from the educated crowd and even in the commentary here quite a bit. It relates to riding, not to ruling, but I can see why someone unfamiliar with the riding aspect of it would assume the other. YES! People look at me befuddled when I use “rein” instead of “reign”. It meant to have your head/freedom folks, not free ruling! Kat, I think you’re preaching to the choir with this post. Or I hope you are, at least. Where is Ellen on this?! I think its’ a MUTE point. I have spell check on my computer, but NOT on Corporete. That his why I sometime’s make mistake’s in my hope to get the new’s out to the HIVE! YAY!!! But, is it a moo point? It just doesn’t matter. It’s “moo”. Add to that: Principal vs. principle. As in, when you make extra student loan payments, the extra should go to principal. I see -ple on here at least once nearly every time there’s a discussion of that topic. 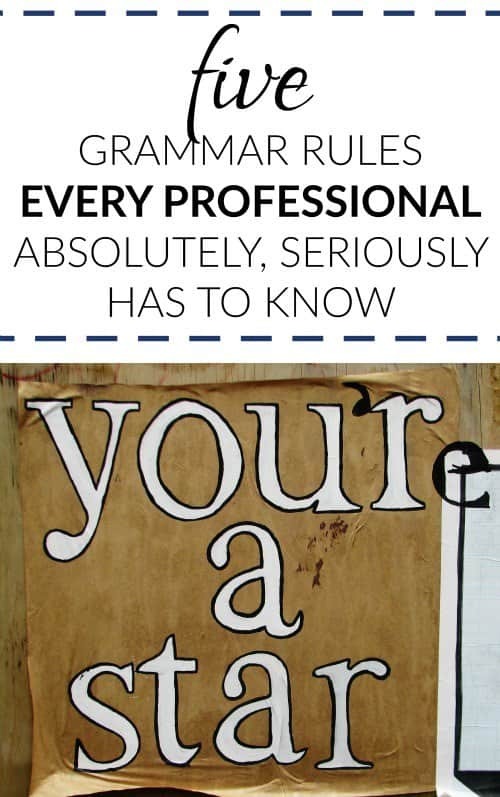 Holy grammar in my post now – ha! *without and ” that faces the wrong way… oh boy. I think that was a Ramona thing too. Discrete/ discreet drives me up the wall. I won’t lie — I don’t know the difference! I didn’t realize there were two different words. I hate when people write LOOSE instead of LOSE. Yes. A million times yes! Please stop telling me to take a breathe, or to just breath. Please. You’re just making my anxiety worse. In regard to, not in regards to. (I was guilty of this one until a partner pointed it out to me). Another one I’m guilty of! I have a friend who does a lot of litigation and this one drives her crazy – she never says ‘with regards to” but often gets quoted that way by court reporters in transcripts. She tries to avoid saying it altogether but sometimes it’s hard to avoid. I know that I’m not perfect but a previous boss made writing mistakes that would drive me crazy. She regularly asked her subordinates to “touch basis with her”. Some of her emails to her bosses would be cringe-inducing. I had a boss that I absolutely adored (still do) who used the phrase “spear of influence.” I never had the heart to correct him. It’s still one of my favorite phrases to this day. I think a spear would be very influential indeed. “I think a spear would be very influential indeed.” LOL, love this. I chuckle every time I hear one of our business development folks talk about “flushing out” an idea. Indeed, many of the ideas are worthy of flushing and not fleshing. My pet peeve is people who write “would of” instead of “would have.” I realize the confusion comes from saying “would’ve,” but it drives me insane. Why do people insist on using longer words to be wrong? The misuse of “myself” also irks me, but it’s another one that’s so common it’s hard to say it will really hurt you to make the mistake. + 1 to both of these! In my field people LOVE to say “methodology” when describing a single method. It drives me bonkers. Yes, we all know you’re fancy with your methodologies. Misuse of the word “myself” has been my biggest pet peeve for years. IME, *very* few people even in the corporate/professional world know the hyphenation rules/apply them properly. I’ve increasingly seen phrases like “it needs cleaned,” or “it needs reviewed,” instead of “it needs to be cleaned” or “it needs to be reviewed.” I have even seen colleagues write this. I’m baffled as to how you can get through college, must less law school, using that phrase. If I’m missing something, please correct me. Do you live in southwestern Ohio? I’m in Cincinnati, but live close to Middletown! Yay! In her defense, being sworn and cautioned does sound dull. Or in western or central PA! I am guilty of doing this even though I know it’s wrong – it amuses me and makes me feel like a townie. My central PA boyfriend and his family, and my Ohioan former boss, are the only people who I have ever heard do this and it drives me up a danged CREEK. Do you mean “crick”? I kid, I kid. Western PA was the same. I didn’t learn that it was incorrect until I was in college and a good friend ribbed me about it. I think it is a western PA regionalism. I routinely hear it from people from there and have never otherwise heard that sort of phrasing. It needs changed, y’all! This cannot stand! I hear it all the time in western PA. I didn’t even know it was a regional thing. I just thought it was a shortening-of-words informal verbal thing. I’m from western PA, but haven’t lived there in over a decade. To this day, I still struggle with this because it sounds natural to me to say “my car needs cleaned.” I can catch myself when writing, but unfortunately it still slips out when I’m speaking sometimes!! BAHA I included western and central PA in this group higher up in the thread! Raised Western-Central PA, living in Pittsburgh now and it’s definitely a Western PA thing. But, “crick” instead of “creek” drives me up the dang wall. Just moved here, it’s terrible. And I came from the South. I live in Central PA and hear it all the time from folks around the H’burg area. I saw a dirty car that someone had written, “I need washed” on. I almost died. Um, that’s another you hear in Southwestern Ohio . . .
Or Kroger’s/Target’s. Oy. I think the bits just travelled up and down the Ohio River. This isn’t just a Southern OH/Western PA regionalism. I’m a NW OH native and I’m in N Indiana now – and these things were considered correct! I didn’t learn the correct grammar until I attended college in New York. And here we can shop at “The Walmart’s” or “The K-mart’s.” We eat Reesie cups. Worst of all, we “dethaw” our frozen food. I’m in an area of Kentucky where there is a lot of Ohio influence, so maybe that’s it. I’m originally from the Mid-Atlantic region and didn’t hear it until I moved here. It’s also a British thing. Very interesting. I feel like someone needs to do a study to trace the path of this phrase. Northern Ohio and it happens here too. In fact, I’m pretty certain I sent out an email this week that said something to the effect of: “This report needs reviewed”. Sorry to say it, but I think my grammar is only going to get worse as I age, and especially as a spend more time working with people that all grew up with the same regional quirks. What’s worse is that in addition to dropping the “to be” from those phrases, I grew up in an area where ebonics was heavily used by my classmates, where “be” is added to the sentence in other cases. As in: “And he be like ‘blah blah blah’ ” “and then she be all ‘blah blah'” – where “be” is used in place of said, among other words. “He be going” instead of “he went” was also common. I’m originally from Ohio, but years of living away has broken me of these habits. Also my mom was not a native Ohioan, and corrected me every time she heard it… It still drives her nuts and she’s lived there for 20+ years now. Okay, I’m in the South, and I’ve heard this construction for *years*, and have never understood how it came into being. Yes, I should read the article someone posted earlier, but I’m too annoyed right now to finish it. I’m from Nebraska, and we do it there also. I promise you that I am a grammar nazi with high credentials, but … this one still gets me, and I’ve been on the East Coast for 18 years. Drive my husband bonkers. I think the best (fun) way to cure yourself of some common homophone issues is to do crossword puzzles! On the other side, nothing is worse than being corrected by someone who’s wrong! Just please be right, unambiguously so, when you “correct” someone else’s grammar. Style and usage have subjectivity to them, and there are better and worse choices to be made, but one’s own preferences do not make someone else’s incorrect, and they are not “bad grammar.” Grammar has rules—but even they change over time—so please be right about them when correcting someone! And if you have a style preference, say so, but don’t pretend it’s a “rule”! Yes, admin, please stop correcting my “Chris’s department” with “Chris’ department”! Actually, that’s a style difference not actual error. In fact, some style guides would prefer the apostrophe without an added “s” because it is a proper noun. Agreed. Glad it came up. I much prefer to not add the S in that case. But I recognize that it’s a style issue, and focus more on consistency if I find it with editing. This is the same admin who types “your welcome” all the time, so I doubt she’s quibbling with me on style points. She’s treating Chris as a plural because his name happens to end in “s”, poor guy. I mean, he’s chubby but he’s still just one person. I used to work with a partner who thought he was the grammar-god because his mother was an English teacher. No, he wasnt a grammar-god. In fact, he was usually wrong or using grammar rules from the 1960s that have since been changed. His favorite critique was “misplaced modifiers” only his definition and the actual definition were completely different. Plus, his definition was a stylistic choice, not a grammatical rule. Ugh. I still get angry just thinking about it. Oh yes. My mother was a managing broker for a real estate firm, and at one time she had an administrative assistant who believed she knew better than my super particular as to grammar and spelling mother. My mother had a listing for a lake house with a boat house outfitted to pull a seaplane up out of the water and house it. The admin changed “handy winch” to “handy wench” in an ad and sent it out to major publications without further review by my mother. Lol. I bet you’d get some clients interested in a handy wench, though! My brother prank called her. She was so flustered and out of sorts about the whole thing that she didn’t even recognize his voice. And, yes, I now see that I accidentally left both the semi-colon and the word and in the last sentence. Face palm. Thank you for this! I am shouting with laughter at my desk! I was just listening to a podcast yesterday about the singular “they” (used to avoid using a gendered pronoun, i.e., “I have to pick up my cousin at the airport.” “Oh, what time do they get in?”). They made some good arguments for it, namely that grammar is not some set of immutable rules, but something that evolves, and there is a good reason that this one is needed. I like it, but I don’t think that I could ever get away with using it in formal writing – people would just think I was wrong. (They interviewed one woman who said that she uses it, but footnotes it the first time so that people know that it was a conscious choice – but I think she was more of an academic writing long documents, rather than something like a lawyer churning out multiple documents a week.) But I certainly could use it, because I find myself having to rephrase or use an awkward “he or she” constantly. I think it’s here and we are going to have to get used to it. I agree, it sounds wrong. But “they” was named word of the year not for being only a gender-neutral term when you don’t know the person — so it might in fact be either “he or she” — but for its use in the case of gender-queer/non-binary people and others who don’t identify as male or female. I’m trying to deal with this now — one of my son’s friends has recently declared, um, themselves, to be gender-queer and requested the use of the pronoun “they,” instead of “he.” This is hard for me because I’ve known this person for years as male and “he” and because “they” still look exactly the same (basically like a hipster lumberjack). Yeah, I saw the article that raised the non-binary issue and it gave me pause. Gah. Certainly if someone wants to be called “they” I will do that. But I want a better pronoun!! My dear old dad used to say “he/she/it”. The “it” was not reserved for gender fluidity but rather for men with long hair. Ah the ’70s. I don’t judge people harshly for using they as a singular gender neutral pronoun, but I always re-work my sentences to avoid it in writing. I don’t care in speaking, but it drive me batty in my own writing. “They” is the word of 2015. I could not hate it more as a singular gender-ambiguous pronoun. Also, this whole post and comment section warms my heart. In French, I believe, they use the male pronoun “il” in situations where the gender is unknown. I think “they” is more inclusive, especially in situations where the gender is unknown or fluid. Officially we do the same. The “rule” is that the unknown singular is male. But this has made me angry since I was five. I remember a note being sent home to my mother about a field trip. The note said things like “please be sure the student has a jacket in case he gets cold.” I was like “but I’m a GIRL and he is for BOYS I’m not a BOY!” It also really confused me when things arrived for my grandmother addressed to Mrs. John Smith. I thought that was hilarious. I told my grandmother “look someone thinks you’re a BOY — they wrote Grandpa’s name on the package but put MRS!” I thought she was trying to fool me when she said that, no, her name really is Mrs. John Smith even though I knew her name was Jane. The French have the gender-neutral pronoun “on,” n’est-ce pas? That means “one,” which we have in English too. But it has a different meaning and can’t always be used in place of he/she or they…it wouldn’t work in TBK’s example above (“Please have the student bring a jacket in case one gets cold.” Nope). I’m all for using “they” as a singular, gender-neutral pronoun! “he or she” is a mouthful, plus is reinforces the idea that someone is a he or a she when there are non-binary, gender-fluid people out there. Until a better alternative catches on, I’m gonna use “they” when I can. I also really like to use ‘they’. You get used to it after a while. Not so much for talking about somebody who is neither he nor she, but mostly in the case where you don’t have information on gender, I love to use they instead of assuming it is one or the other. As for the alternative (OP-I-want-a-better-word), in Germany I can think of two things that are being tested in academic environments (the public mainly smirks and gossips about it). Almost any people-descriptive noun in German indicates gender, especially professions (think steward/stewardess). Historically, in legal text and bureaucracy, you’d use the male version. So some university decided to simply switch to always using the female version for professor/student/staff member in their regulations. What an uproar! I’d rather use zhe than they. We need a nongendered pronoun. Let’s just make a new one instead of coopting something that is well understood to be plural. It makes a whole new set of problems if you can’t tell whether a sentence (out of context) is referring to one person or many. For example: They’re storming the castle! One transgender person? No need to worry. An angry mob? Probably should pull up the drawbridge. I’m glad you raised the singular “they.” It has a long and storied usage dating back to the 14th century. I’m happy to see it coming back into vogue. The singular “they.” Good enough for Shakespeare; good enough for me. If I could only get my co-workers to appreciate an appropriately used semi-colon. YES. I’m surprised this one is so far down the list. Nite vs Night (There can be debate over the correctness of “nite” but seriously, just don’t use it in a professional setting). One of my pet peeves is “is in need of” instead of “needs.” It’s not incorrect but it’s completely unnecessary. Ditto about the unnecessary apostrophes and capital letters to emphasize a word. Drives me nuts. Certain people I work with are the worst comma abusers. There are so many commas, everywhere! In the middle of sentences where commas should have no right to be, there they are! It absolutely drives me batty! I’m a comma abuser, and I’m sorry. I am a comma abuser, and a comma splicer. Sorry. When I’m not busy I really do try to catch it. Heavy commas are okay. Just read the New Yorker. Their editor has vigorously defended the style. She calls herself “Comma Queen,” even. If it’s okay for the New Yorker, it’s okay, period. How do we feel about funky regionalisms? Like I’ve been known to say “might should,” which is apparently a Southernism (for those unfamiliar, it just means “ought to.” Eg: “It’s going to snow, I might should go to the store before they run out of bread and milk.”). Or for that matter, “y’all”? Best avoided all together or ok if your audience is from the same region? I love colloquialisms but would keep them spoken and not written. Agree. 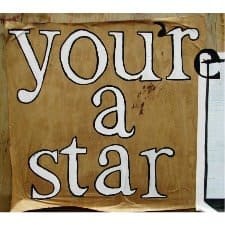 Or if you must write it, punctuate it correctly. I see ya’ll fairly consistently on social media, and it drives me batty! uggggghhh this is a tough one and down to personal preference. Regionalisms are my biggest peeve. I try to avoid all together; if there’s an audience who doesn’t use it themselves, your regionalism is going to sound bizarre at best, uneducated at worst. Ha! My husband makes fun of me for that one all the time. I know someone who uses the phrase “unless if” when all he needs to say is “unless.” As in, “the event will be in the part on Friday, unless if it rains.” It drives us crazy, and we don’t know if it’s a southern California thing or just some weird thing he says. How to you spell “yous guys” (the first word)? I was going to use that as an example and then realized I had no idea what the accepted spelling of the first word was. “Y’all” is the greeting I use in group emails to mixed gender recipients. Yay Texas. Midwesterner here, and y’all is useful! Distinguishes you singular and you plural. Imma run to the store right quick y’all. An example would be “Let’s go get ice cream after.” Or, “I’m going to take the dog for a long walk after.” I don’t know if it is regional or just my nutty family. I lived in the South for a spell and “used to could” gets me every time. So much more succinct than “used to be able to” but so silly. TJ: I have a friend getting married in May, in a destination-ish city where we went to college together. There are no direct flights from my city and right now the cheapest tickets are $450 (pricey for me) and hotels $200/night. I am going to the wedding and my SO is staying home due to cost and childcare. Her bachelorette party has been scheduled in March for Easter weekend (Fri-Sun) in DC — she and most of my friends live in DC/VA. I could get there and stay for cheap, but it’s Easter and I’d have to depend on my SO to stay home and take our daughter to church/family festivities which is not something he enjoys. None of the other girls going have kids. I enjoy Easter with the family, but I realllly don’t want to miss out on a fun girls trip or the chance to celebrate a friend. Also I am getting married within the next 18mos and I’m not planning to have a bachelorette party. How important are bachelorette parties in ya’lls relationships with friends? It would have been fun when I was single, but the long-distance batchelorette party is a bit much once you have tiny ones (I think b/c you’re probably ALSO going to be going to a wedding shortly, so another disruption). Different if you are in town / don’t have tiny ones. If I were to skip one thing, in this case, it might be the wedding. I think the girls trip would be much more fun for you and relationship-feeding. You can send a nice gift and a good friend would understand. Just say no. With everything you have laid out I would never expect you to attend my bachelorette weekend/party (assuming I would even have one). You might have better luck on the afternoon thread, but I don’t think they’re that important. Fun but not necessary. If you want to go, go, but no one’s going to be upset that you’re skipping the weekend for Easter with your family. At least no one rational. Thanks, I’ll repost. It’s more of an I’m sad I can’t go and be part of the girls weekend, can I please beg out of Easter Bunny duties? I would not go in your shoes. I think the only situation in which bach parties are even close to mandatory is if you’re IN the wedding, and even then, kids and the fact that it’s so close to the wedding provide very legit reasons to skip it. I disagree with anon above, I’d definitely skip the bach party over the wedding. We didn’t do bach parties in my circle of friends (in large part because a lot of us didn’t really want our guys having stereotypical bach parties), for which I’m very grateful. I love travel but not when someone else is dictating all the plans. My two closest GFs and I try to do a girls trip every couple of years and it’s awesome because we all get to have input on cost and destination and we don’t have to put up with a bossy bride or MOH. As a bride, I would not have been upset at you for not coming- just in general, doubly so with kids, triply so with travel & quadrouply so on a religious holiday weekend. YMMV- some people are laid back, others are not. Personally though, I use bachelorette parties to see my friends. They all live on the east coast & I don’t… and I really miss them, so I make the extra effort to go. That said- we always put out a list of dates & try to whittle it down to one that works for everyone & we usually automatically push out any Christina or Jewish holiday weekends for that reason. Although one friend did get married on an Easter weekend (cross country) & even though I really would have liked to be with my family, I decided to go. I’d like to add another. When in doubt, start a new paragraph. This is particularly recommended for emails. Yes! I hate reading a wall of text. Break it up! In a post-Mean Girls world, I use this ironically. It’s, like, the laws of feminism. “Off of” . This is plain wrong. Correct: I will get off my soapbox now. Wrong: I will get off of my soapbox now. Heals instead of heels. I have two friends who say they need new “heals” and I don’t have the heart to correct them but it’s always jarring. I’ve also seen bald and bold confused plenty. Rational and rationale seems like an important one for lawyers to know, too, but not all do. On social media, when someone refers to crying, I’ve seen bald, balled, bold. Ladies, I think you mean bawled. In a similar vein of “awe,” can we talk about the overuse of “awesome”? “Michelle and I’s” rather than “Michelle’s and my”. This one drives me insane. Since when is “I’s” a word? Ahhhh me too. Frequent offender: anyone on The Bachelor or Bachelorette. Yup! I correct this (and every other incorrect pronoun usage) every time and my husband just laughs. I tried once to make it a drinking game, but my liver couldn’t handle it. Or even just “Michelle and I” without the plural…e.g., “This is a photo of Michelle and I.” NO it’s a photo of “Michelle and me”! I’m ALMOST to the point where I’m ready to start openly correcting people on social media. I wrote a long Facebook post recently detailing how to tell if one should use “I” or “me” recently, and was floored by how many people weren’t taught the rule in school. I’m fairly certain I was taught the following in second grade. Delete the other person and see how it sounds. I’ll let you all know how many friends I lose once I start correcting Facebook photo captions. It’s great you said “I lose…” instead of the all-too-common “I loose…”. Thank you for noticing! That’s another one that drives me crazy. I saw a terribly clever The Oatmeal cartoon explaining the difference between “lose” and “loose,” but it’s not particularly safe for work. +1. This drives me up a wall. “I’s” is not ever acceptable. “Off of” drives me into a rage, especially when used in office context. I am sad that this it is considered almost mainstream usage now. Drives me “off of” a cliff, so to say. How do people use “off of”? Besides “off of a cliff,” which is correct, no? Where I grew up, it was “borrow off of you,” copy off of you,” etc. OFF does need another OF! Jump off a cliff. Copy from a book. This is usage and not grammar, but the one I cannot unseen and that drives me crazy is “is comprised of” – usually when people mean “is composed of” but they think it makes them sound smarter to use comprise. I find it helpful to think of comprise as roughly equal to contain – if you can’t substitute contain and have the sentence make sense, you’ve probably misused comprise. And no sensible person would say “this group is contained of (list of elements/members).” So no one should be writing “is comprised of”. And yet there it is again and again. Yes! This is what I was going to post. The whole comprises the parts. I can’t believe that no one has mentioned “a whole nother issue.” It’s only a verbal thing, but “nother” is not a word! Please, people, the word is “other.” An other. Another. But not a nother. I think you mean it’s only a spoken thing. “Verbal” includes words expressed in writing as well as orally. I actually think this comes from tmesis: another becomes a whole ‘nother. So I don’t think of that as incorrect really. I always ask to hear their poem. Drives me nuts! – “I feel badly” about/for someone/something. Badly = adverb. Feel=intransitive verb. You’re doing it wrong. You feel bad. The overuse of “myself” drives me crazy. You almost always want to just say “me.” Saying “myself” does not make you sound smarter or more professional. Thought of another one, which is rampant on the internet: Asking for “advise” rather than “advice.” Ugh! I can’t stand “please advise” as an entire sentence. I’m probably in the wrong profession for this pet peeve. Isn’t ‘please advise” be correct there? “Please advice” certainly isn’t right. Yes, please advise is correct. Advise is the verb, advice is the noun. I don’t think Blonde Lawyer was saying that “advise” as used there is incorrect, but rather that she hates “Please advise.” as a standalone two-word sentence. It was a tangential thought sparked off by Senior Attorney bringing up “advise” vs. “advice.” Just my reading, though. And a chain of synonyms, “I analyzed and reviewed it…” “We need to consider and calculate…” On and on. Drives me nuts. You don’t need to use synonyms in the same sentence. In general, people who think they need to write three sentences to express a single thought. Yes. I hate the 2 word sentence even if it is correct. I will 100% admit to not being particular about going back and fixing my mistakes with its vs it’s places like this comments section. Especially when I am on a smartphone and I’m lucky I got all the letters there in the first place – half the time when I try to edit something on a touch screen I wind up tapping the wrong word and making a bigger mess. I try to just write out “it is” as that is actually faster than having to tap over to the special characters screen for the ‘ (it is = 5 taps on one keyboard layout, it’s = 5 taps but between 2 keyboard layouts). I don’t like improper use of the word “that” as in “People that are in this position” when it should be “People who are in this position”. It’s people WHO and things THAT. I’m late to this party, but I’m surprised not to see “do diligence” mentioned. In a previous position, we had an IT director who would always talk about how her team was “doing diligence” on a contract. Drives me INSANE but so, so commonly misused. Haha, we were posting about this at the same time. Hello, kindred spirit! My biggest pet peeve is people using “which” instead of “that.” “Which” is not a fancy version of “that,” it introduces a dependent clause set off by commas. It is one of the things that bothers me most in my subordinates’ writing. NOT “It is one of the things which bothers me most…”. My subordinates’ inability to use words correctly, which drives me crazy, will hold them back in their careers. I know the rules, but I somehow always end up with mistakes in emails… even when I proofread something a million times, so I like to give others the benefit of the doubt, for the most part. Kind of related- my wedding planner misspelled my venue’s name wrong in EVERY email and it annoyed the heck out of me. 1) use of a backward slash instead of a front one (lunch\dinner, his\hers). Makes my skin crawl! 2) not grammar but…I work at a top-30 university, and our VP of HR sends out all emails, which go to 3000-plus employees, in bold cobalt blue Comic Sans. I also have a colleague whose email signature is her name in italicized Comic Sans, followed by her title and contact info in Arial or whatever. Comic Sans is the absolute worst. And it usually co-occurs with many of the grammatical sins in this thread. My biggest pet peeve is misuse of the word “very” when it’s used with words like unique, first and last. Unique means one of a kind so there’s no degrees of being unique and there can’t be two “firsts” with one being more first than the other. What about “risk adverse?” I didn’t even know people made that mistake but I’ve encountered it twice this week. I had a coauthor do this. So embarrassing since we’re economists.